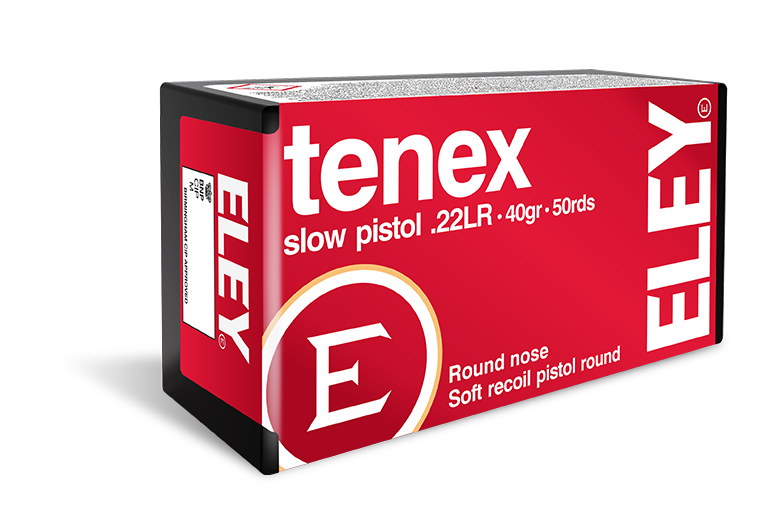 Our new pistol line showcases ELEY tenex slow pistol – a round-nose bullet profile with superior accuracy at a lower velocity for maximum control. Decades of continuous improvement have generated the perfect reduced velocity pistol round. Technical research and testing in ballistics, semi-automatic cycling, optimum bullet profiles, priming systems, case construction and the perfect lead alloy have enhanced ELEY’s knowledge in this sector. Comprehensive testing was undertaken to find the ultimate combination of these elements, to produce ELEY tenex pistol. Precise manufacturing techniques form cartridge cases of uniform length from a tightly controlled brass alloy. This ensures each propellant charge burns in a controlled volume, delivering a consistent energy to each projectile. Providing a controlled recoil pattern and rapid recovery of sight picture. Accuracy with ELEY tenex pistol can be improved by matching the pistol and ammunition at our testing facilities in the USA and Germany, both have 25m and 50m lanes. The world’s leading athletes all test their ammunition and leave nothing to chance.